Make life easy on you and your client. Forewarn your clients in plenty of time to make sure you get data in early. Send out any appropriate letters or reminders to arrange meetings or collect data from clients in good time. 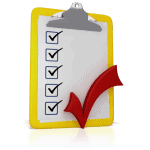 Send a check list to help your client prepare data for you. July: June BAS monthly and quarterly, start with any companies that that you did March accounts for. For tax planning purposes these entities will be easy to complete. August: Monthly BAS/IAS, PAYG summaries. Start sending letters to entities with more than one year of returns to lodge they are due by 31st Oct. Any entity that needs to be lodged with APRA or TCF need to be lodged by 30 September. September: Monthly BAS/IAS. Focus on 31st Oct clients. November: Focus on getting in all clients with SMSF so that they are lodged before Christmas. BAS – which are currently done in-house- can be given to us.